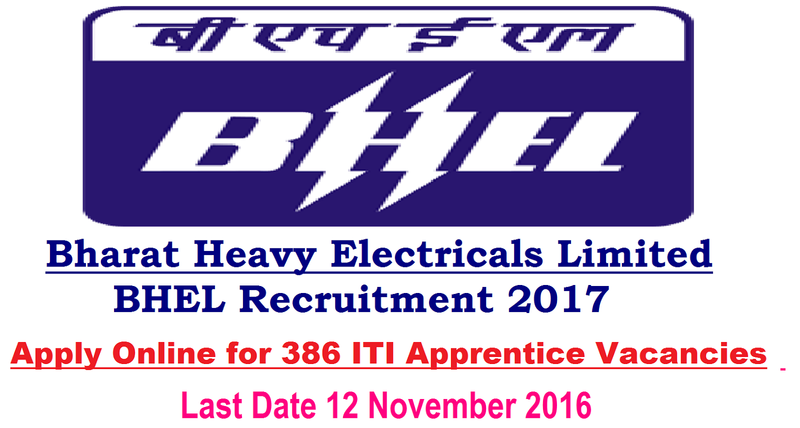 BHEL Recruitment 2017 – 2016|Bharat Heavy Electricals Limited – BHEL Recruitment 2017 – 386 ITI Apprentice Vacancies – Last Date 12 November 2016|BHEL, Bangalore invites application for the post of 386 ITI Apprentice in Various Trades. Apply Before 12 November 2016. Educational Qualification : Passed ITI in Relevant Trade from recognized institution by the Government. How to Apply BHEL Vacancy : Interested Candidate may apply Online through the Website www.apprenticeship.gov.in on or Before 12.11.2016 & Send the Printout along with self attested copies of certificates & Document to the DGM (HR-Administration), Bharat Heavy Electricals Limited Electronics Division, Mysore Road, Bangalore – 560 026 on or before 15.11.2016.